Immerse your learners into the world of the patient’s experience, including a target disease state and the treatment environment such as a doctor’s office/practice, pharmacy, or hospital. Our Interactive Patient Cases and Virtual Preceptorships bring to life the physician-patient interaction as well as the various HCP roles and responsibilities in each environment. They also allow learners to hear the perspectives of HCPs and patients. Hear how your target physicians treat your target patients in a way that is cost-effective, reusable, and respects patients’ rights. See and appreciate the entire diagnostic and treatment process, including analytical tools, various treatment sites, therapeutic options, and evaluation tools and techniques. Hear and see differences in physician perspectives on the diagnosis and treatment of the target disease and how it fits into their overall practice priorities. Put themselves in the role of the physician in making diagnostic and treatment decisions. See actual test and treatment locations, equipment, procedures, and results. Demonstrate content mastery through the use of assessment tests. Minimize time off-territory while maximizing learning about their customers and their customers’ customers (the patients). 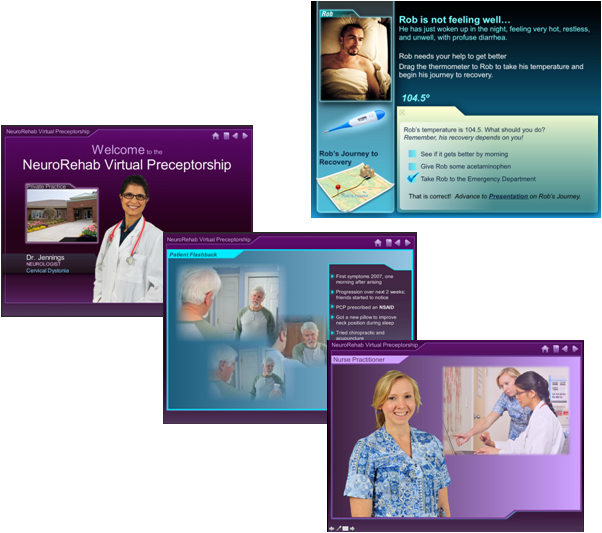 Contact us to learn more about Interactive Patient Cases and Virtual Preceptorships.